The esoteric subject of central bank independence is becoming a polarizing election issue in Japan. Both Prime Minister Yoshihiko Noda and his rival, the Liberal Democratic Party leader Shinzo Abe, want the Bank of Japan to do more to end deflation. Yet while Noda’s ideas are outmoded, his rival’s are risky. Abe wants to dictate a target of 3 percent annual price gains to the central bank. By contrast, Noda insists that the BOJ must remain free to choose its own inflation goal, which it has set at 1 percent. Yet Noda’s approach looks out of date. The theory of monetary independence is centred on the premise that voters can only resist the siren song of wage increases by appointing a hawk-like central banker who will keep the economy tied to the mast of price stability, no matter how much politicians beg for relief. But that theory breaks down when deflation – not inflation – is the enemy. 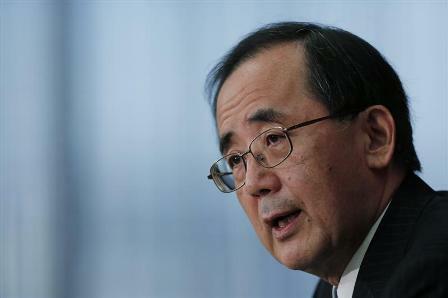 BOJ Governor Masaaki Shirakawa has dismissed 3 percent as an unrealistic goal. But it’s not the numerical target that’s important, but who gets to decide it. One option is to follow the successful example set by New Zealand, where the central bank governor signs an inflation-targeting contract with the finance minister. Abe, who is the favourite to win the election, could give it a try when Shirakawa’s term ends in April. However, Abe’s proposal that the BOJ should be persuaded to finance public works goes too far. Noda is right to point out that dumping bonds on the BOJ might breed fiscal indiscipline. It could also, as Shirakawa argues, lead to reckless money-printing. If Tokyo fails to stabilize its debt, there may come a day when private-sector buyers shun the government IOUs that they currently can’t get enough of. Tokyo will then have four options: raise taxes, cut expenditure, impose haircuts on creditors or pressure the BOJ to monetise public debt, as economists Takeo Hoshi and Takatoshi Ito recently noted. With 10-year bond yields below 0.75 percent, the day of reckoning is some way off. Abe needn’t to bring it any closer. Bank of Japan Governor Masaaki Shirakawa on Nov. 20 dismissed as unrealistic a 3 percent inflation target advocated by Shinzo Abe, leader of the Liberal Democratic Party. The BOJ is currently targeting 1 percent inflation. Abe has also said he would consider making the Bank of Japan purchase construction bonds directly from the government to tame chronic deflation if he becomes prime minister. Prime Minister Noda told the Financial Times on Nov. 18 that the BOJ must remain free to set its own numerical targets on inflation.